Ceremonies & Passages | Every moment is a journey to remember! Every moment is a journey to remember! Ceremonies and Passages is pleased to share about their membership in the International Association of Professional Wedding Officiants. 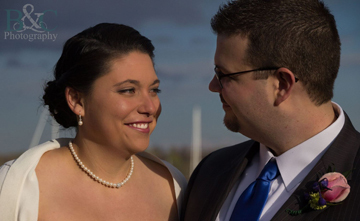 IAPWO offers continued training and development to better serve officiants in supporting the couples they work with. Ceremonies and Passages is also now a member of the North of Boston Convention & Visitors Bureau (NBCVB). The NBCVB promotes the towns and cities north of the Boston region as a destination for corporate and personal affairs and travel. Established by legislation as one of the state’s 16 regional tourism councils, NBCVB is the official liaison between the North of Boston region and the Massachusetts Office of Travel and Tourism. The NBCVB has been in existence since 1955. The NBCVB also supports couples who are planning weddings with resources such as venues and services. Couples needing information can go to the website to research or call for a copy of their destination planner. Here’s to celebrating new connections. Wow! What a wonderful surprise! This morning I received an email that the services of Ceremonies and Passages received a Best of 2016 Award from Thumbtack. I want to thank all of the wonderful couples I have had the honor and privilege to marry over the past couple of years. You are some of the kindest and loving people I have met and I wish you all the best in your visions for the future together. For those planning their wedding this year, give me a call. There are weekend dates still available for the 2016 wedding season. Fun Weddings & More to Come! How fun is this! 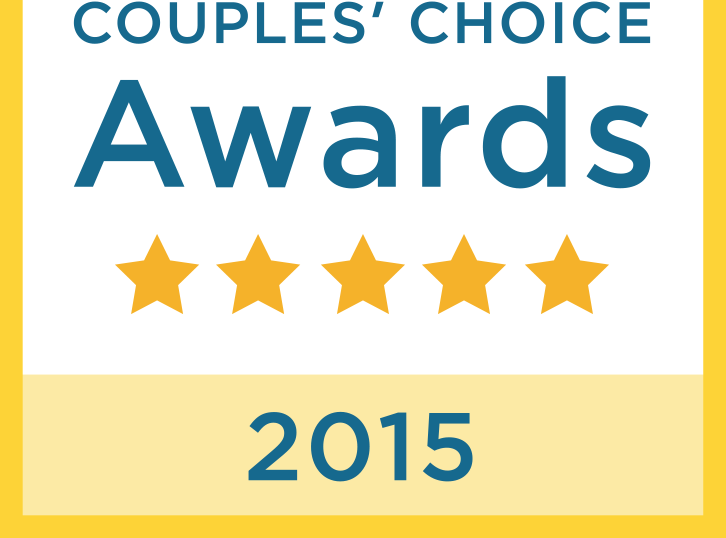 An award for being in service to the many couples who used my wedding officiating services this past year! I LOVE working with couples creating the ceremonies of their dreams. It is an honor and pleasure to support everyone with their dreams. Thank you for the gifts you each have been and for those who are considering working with me. How Fun Wedding Season is! In Muslim traditions garlands are bestowed upon the couple. They were so beautiful and smelled so incredible. Wedding season has begun for me this year. In April I had the honor of supporting a lovely couple who had taken a journey through many countries for many years before getting married. It was a wonderful opportunity to expand my own knowledge and bring compassion and the love of my craft to the forefront. She was from Bangladesh and the US and he was from Belgium. A multi-cultural and multi-religious collective desiring a non-denominational ceremony. 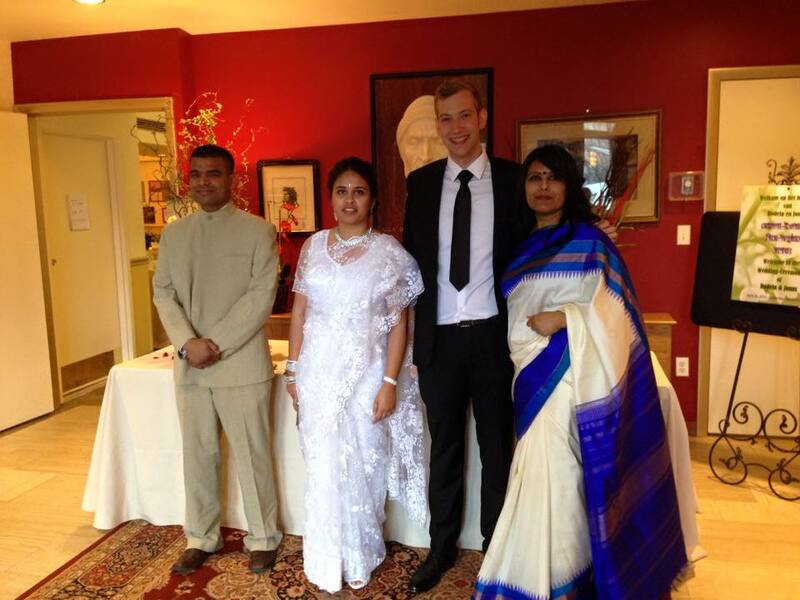 Working with the couple and family members we created a beautiful ceremony enjoyed by all. in writing the ceremony, we put important pieces in to place to honored the brides roots. 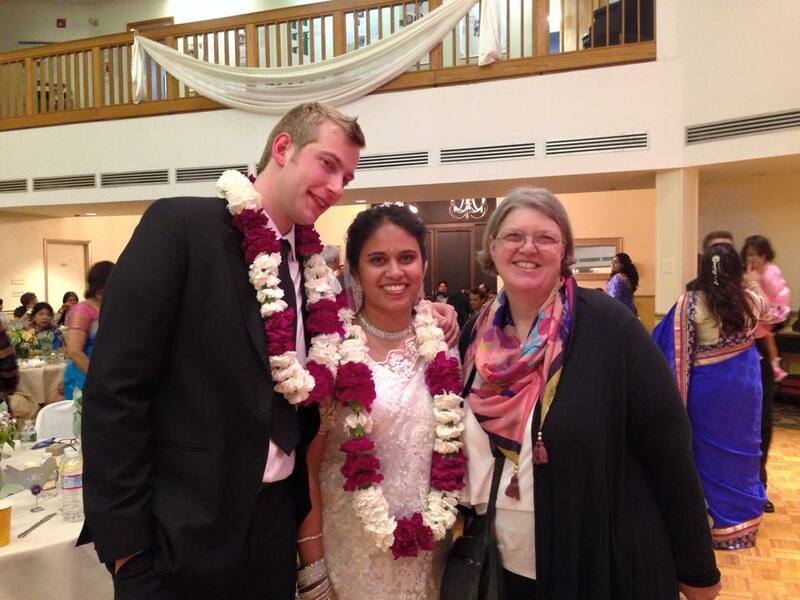 A family friend led the placing of floral garlands made of carnations around the couples necks. Two young cousins brought the garlands forward to the stage. Next, another cousin brought a cup forward of a sacred juice for the bride and groom to drink from. After the ceremony, various friends and family members came forward offering prayers and stories. 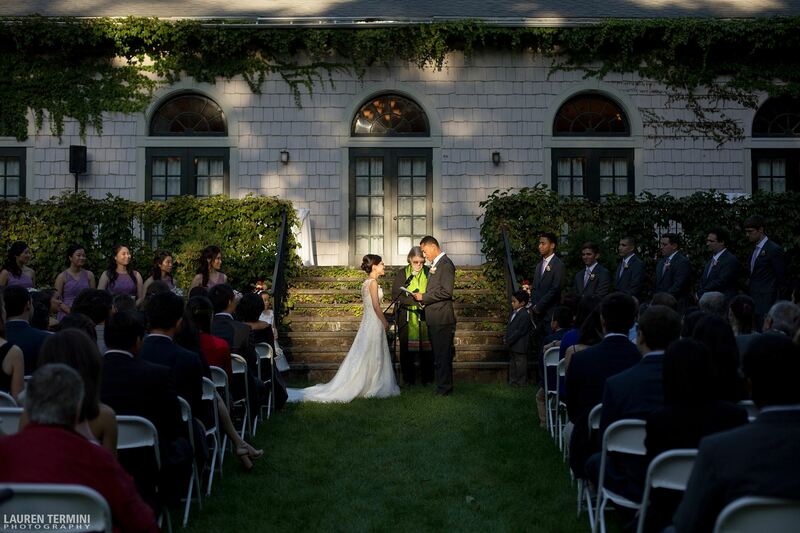 This ceremony was incredibly beautiful and the couple left for new adventures in Singapore a few days later. What will you need to incorporate into your ceremony to honor your family and cultural traditions? Let me know! Together we can craft any ceremony you dream of having! Got Engaged? Get your booking in! 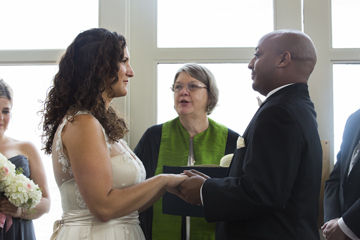 What an incredible year last year was bringing happiness to couples from around the country at their ceremonies! This year is shaping up to be even more incredible! If you have gotten engaged get your bookings in if you are planning your wedding for this year. At this point the phone is ringing off the hook and there are many interviews happening. I have resources I can share about possible venues and services aside from my own. Weddings and commitment ceremonies are steps in your future as a couple. The words you speak that day shape the rest of your life and how you interact with one another. It takes time to craft special written ceremonies that represent who you both are and the integrity of your relationship. I create ceremonies geared to both of you. From readings, vows, to those special wedding traditions like candle ceremonies, honoring those who have passed and are there in spirit, to traditions that no one has ever done. Humorous light-hearted ceremonies are fun too. Quotes from movies, characters in novels, and themed weddings can be a lot of fun to research and create. With Valentine’s Day coming up, I am looking forward to hearing from you and being of service for your special day! We just got off the phone with the folks at WeddingWire.com! 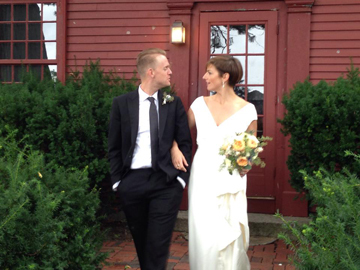 Ceremonies and Passages is now rated as one of the top officiants in the Boston and North of Boston region! Join us in the celebration! This past summer has been filled with some incredible weddings to officiate. The couples I have had the pleasure to work with are beautiful, loving and so ready to step into creating the visions of their future. Here are some images from their ceremonies and services. Friends and family gathered to celebrate the wedding of Lori and Scott. Lori’s daughter’s took hold of making the cakes. 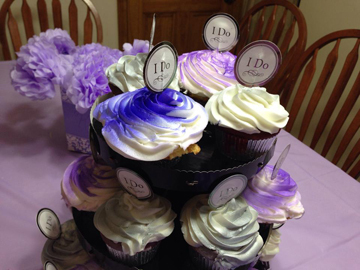 These are just some of the many beautiful cupcakes they had decorated. Home sweet home! Joann and Ian are avid readers and love science fiction. We wove some references to their favorite movie into the ceremony at their love filled seaside wedding. I have never been to Revere or Winthrop. How wonderful to go there for Nancy and Bill’s early summer wedding! 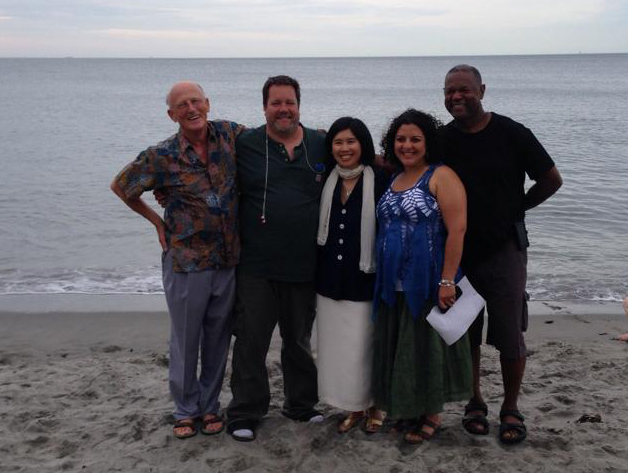 We walked to the beach behind their home with children and grandchildren and friends with us for a sunset wedding. At the end a friend led a fun tai chi exercise to blessed their day with beautiful energy. Thomas and Robert wanted a Summer Solstice morning service by the water. Family came up from Tennessee and the thought of butter cream frosting on the cake was on everyone’s mind. They never thought marriage would be available to them. What a gift to create their special day with them. Officiating in Boston is an adventure and fun! Kathleen and Aly have a level of optimism and love that oozes from them is beyond anything I have ever experienced. 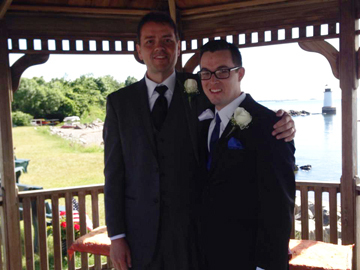 Laughter was the total order of their wedding at the Boston Harbor Hotel. 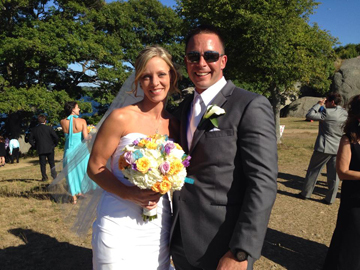 Lisa and Derek chose the weekend of the Schooner Races in Gloucester to have their wedding overlooking the harbor. A windy day with boats in the harbors and picnics all around them. They wrote their own vows to one another. Incredibly touching! Lindsay and Adam grew up in Massachusetts and started planning their services while I was in California. Fun was the name of the game at their wedding at The House of the Seven Gables. As the rain came in during their service, we kept going. Afterall, rain drops are blessings! I look forward to working with all of the couples getting married this coming Fall and Winter. From Halloween themes, to early Thanksgiving, to sweet and beautiful ceremonies being planned, I love putting together ceremonies that represent the integrity of the couples. Many blessings to everyone!